On Friday, Veterans Affairs Canada launched a campaign to mark the 75th Anniversary of D-Day and the Battle of Normandy by sending a pair of combat boots on a cross-country journey. The ceremony was held in the main hall of Pacific Central Station in Vancouver, British Columbia and began with the singing of O Canada. Soon thereafter, the flag party and pipe band accompanied the pair of boots into the building, where they were placed on a pedestal next to the podium. The Juno Beach Centre Association, represented by Board member HLCol Don Foster, the son of a D-Day veteran, and staff member Scott Entwistle, assisted VAC by organizing the attendance of seven of our Legacy of Honour (LoH) veterans for this launch. George Chow and Norm Kirby (two D-Day veterans) addressed the crowd and the other LoH veterans in attendance were Harry Greenwood, Jaye Edwards, Hugh Buckley, and Ed Peck. Unfortunately, George Flynn sent his regrets at the last minute. Their stories can be found on our website. As you can see by the media releases (links below) Norm Kirby and George Chow did a great job of speaking on behalf of all Second World War veterans for this important commemoration. Following speeches by the VIPs, the boots were escorted out of the terminal by four members of the Canadian Armed Forces and were placed on the train. A reception followed, in which the assembled veterans gathered around a conference table to share stories and sign posters for the young cadets who were present, as well as anyone else who was interested. The veterans all appreciated the symbolism of the initiative. 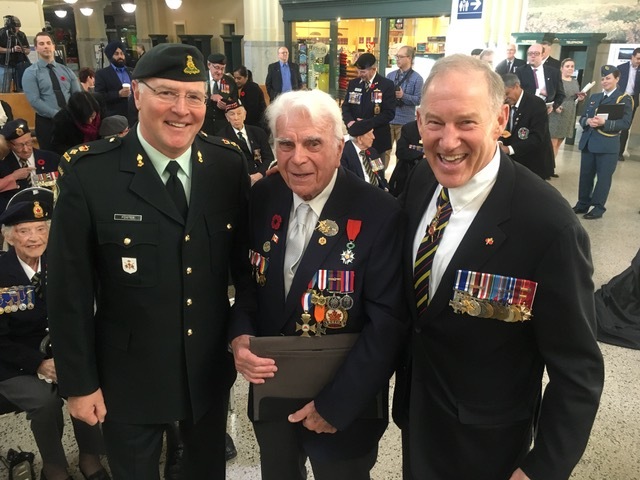 Although the main focus of the commemorations this spring will be focused on Normandy, ceremonies like these make for a great way to connect the experiences of Canadians overseas with those at home, just like these train stations were often the connection between Canadians at home and those serving overseas during the war. The reception afterwards was a great success, and the cadets present were able to have meaningful conversations with the veterans, as well as to come away with a souvenir they will cherish forever. The veterans were delighted to have the younger generations there, and to share their stories with them.